Delivering a firm hold that remains dry and reworkable all day long, the Balmain Hair Matt Clay Strong allows you to create your desired style with ease. Ideal for both men and women, its blend of Argan Oil and Silk Protein smoothens frizz and flyaways, whilst adding ultimate texture and definition with long-lasting control and a matte finish. 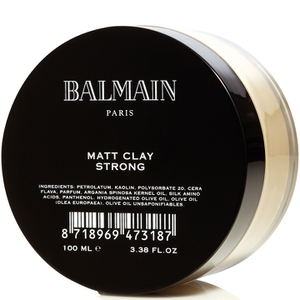 Imparts the brand's signature fragrance and protects dry, weak hair from environmental damage. Rub between hands and apply to dry or damp hair. Style as desired. Petrolatum, Kaolin, Polysorbate 20, Cera Flava, Parfum, Argania Spinosa Kernel Oil, Silk Amino Acids, Panthenol, Hydrogenated Olive Oil, Olive Oil (Olea Europaea), Olive Oil Unsaponifiables.